This plugin detects and reports spammers using web sites and services like StopForumSpam.com and WhatIsMyIPAddress.com. The plugin is aimed at moderators who suspect a user may be spamming. The plugin will add a panel to the "Edit this user in Mod CP" page, with information from StopForumSpam.com on the user's username, e-mail, and IP addresses used. It will also do a reverse IP lookup and get the user's hostname, ISP and organization from WhatIsMyIPAddress.com. 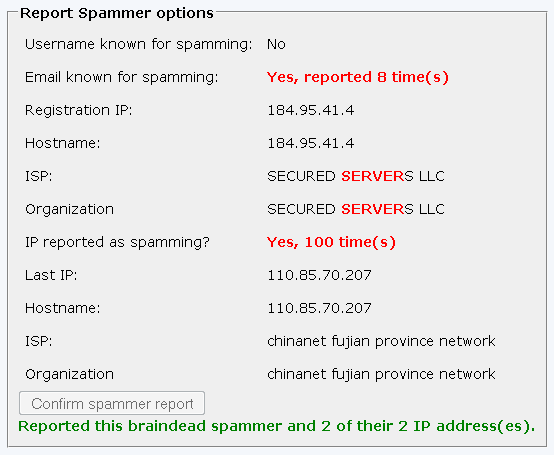 Since many spammers use server farms for bot accounts, ISPs that have "server" in their name (e.g. ubiquityservers.com) will be flagged. Based on this information, plus other information from the user's profile and posts (if any), a moderator can make a decision as to whether the user is a spammer or not. The plugin allows your specified usergroups to report a user&apos;s profile. This may help to prevent profile spam. 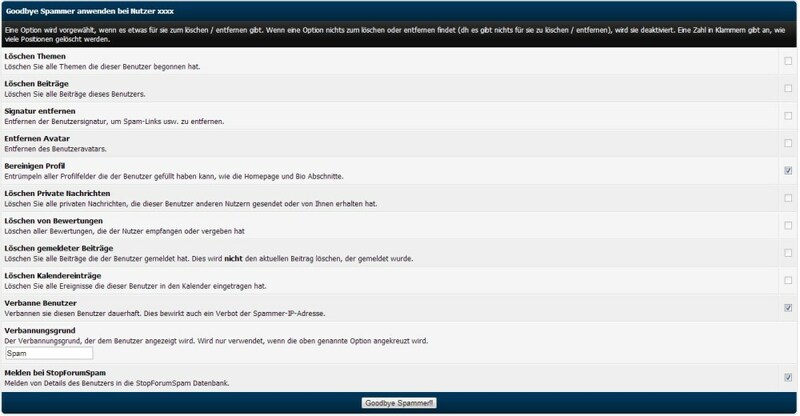 Macht es einfach, alle Spuren von einem Spammer aus dem Forum zu löschen. Allows you to report reputation if it is spam/abuse etc.